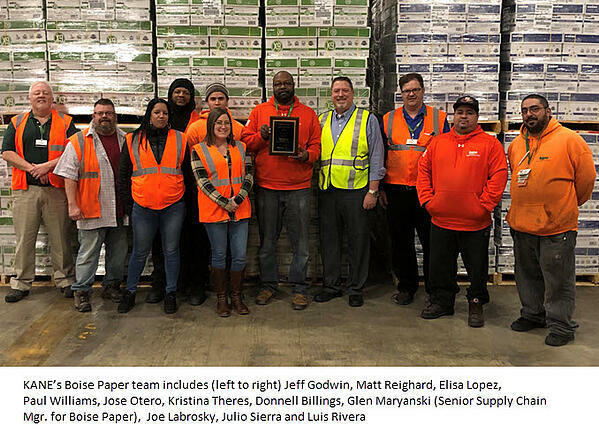 KANE has received Boise Paper’s 2018 3PL of the Year Award for best overall distribution center performance. The award recognizes operational excellence in logistics throughout Boise Paper’s physical distribution system. Boise Paper has 24 distribution centers (DCs) in its U.S. network. Annually, the company’s supply chain and logistics leadership team rates and ranks these operations on nine key operational measures: customer service, shipping and receiving accuracy, process adherence, ease of doing business, IT interface, business relationship, transportation, product handling and storage, and inventory accuracy. On these measures, KANE outperformed Boise Paper’s other third-party logistics (3PL) providers to earn the 3PL of the Year award. KANE previously won the award in 2016.